A sturdy, loud and proud acoustic strummer, with a big amplified sound that would sit nicely in a band mix. Acoustic volume and projection; well-rounded sound; peformance-ready preamp system. The body can feel a little cumbersome. It's fair to say that Vintage is now a major player in the low-end acoustic and electric world. Recent years have seen the company (an in-house line of the UK's John Hornby Skewes & Co) team up with industry heavyweight Trevor Wilkinson on the electric side of things, leading to a marked improvement in the spec of its electric range. Now Vintage has collaborated with another industry legend in the shape of American acoustic pickup specialist Fishman. JHS took on distribution of Fishman last year and this has led to its preamps and pickups being rolled out across Vintage's re-launched electro-acoustic range, allowing JHS to maintain its advantageous prices and something-for-everyone philosophy. The VEC500 is fitted with the fixed Ion Plus system and utilises the same Sonicore under-saddle pickup, the only omission being the mid-range EQ control. The Ion Plus occupies minimum space on the upper bout of the guitar, leaving more wood in place. This should, in theory, have less effect on the acoustic tone. The VEC500 also features pre-wired Fishman endpin jacks. This level of electronic innards at this price demonstrates JHS's aggressive spec and pricing policy. 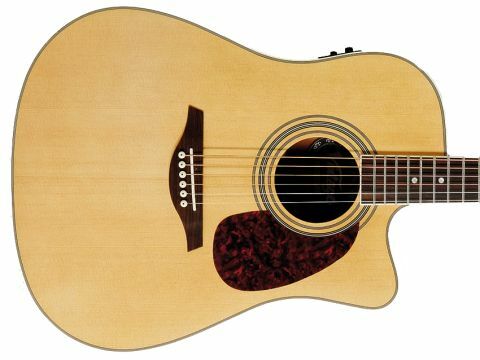 The naturally finished VEC500 takes on a dreadnought shape, with a slopping peak to the cutaway and a more elongated, deeper body with wider, flatter shoulders. The VEC500 is also deeper at the rim compared to the VEC350, which makes it a bulkier proposition - giving you less right arm angle for flatpicking, but making for a nice heavy strumming action. The all-nato neck with rosewood 'board shares the same neck profile and scale length as the VEC350 according to Vintage. However, we found a less pronounced 'C' profile than on the VEC350, and it certainly doesn't sport the soft 'V' towards the nut. Having said that, it remains a very comfortable and chord-friendly shape. Finishing is again impressive and the Martin-style cutaway tortoiseshell pickguard and off-white binding gives the VEC500 a more old-school vibe. Overall, the guitar feels sturdily built, business-like and rests nicely on your knee. Out of the box the set-up is of an excellent standard, starting the test on a high with an easy low action. The VEC500 is a loud guitar and there's a lot more boom and projection present when comparing it directly to the VEC350. This is due to the physical dimensions of the body and - we'd like to think - that solid top delivering a more forceful and strident top-end. Conversely, it does lack some of the subtleness of the VEC350. The Sonicore delivers a natural and woody tone and seems to revel in the VEC500's bigger sound. The Ion Plus preamp is a neat and simple-to- use unit, and concerns about the omission of the middle EQ can be counterbalanced by the EQ on an acoustic amplifier or PA. All in all it provides a very usable and appealing acoustic tone that'll do the job in a variety of gig and home recording environments. Vintage has a noted reputation for delivering entry-level acoustics with impressive build quality and specification - add in the Fishman electronics and they look even more attractive than before. The VEC500 fits a serious beginner who wants a good sounding acoustic, and also wants to be able to plug it in. It would also maybe suit a more experienced player who needs a backup guitar.